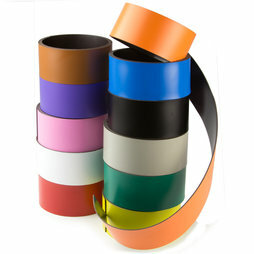 This colourful magnetic tape is 40 mm wide and available in many different colours. It consists of strontium ferrite, the front side is laminated with light-resistant PVC. It can easily be cut to the desired length with standard scissors and labelled with pencil, pen or waterproof marker. You can remove most of the writing with alcohol, petrol or eraser, but marks might remain. 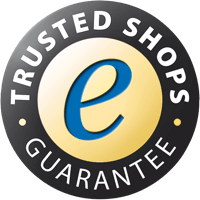 You can find more detailed information in our FAQ labelling. You can also print on a magnetic tape via digital or screen printing. Please read our tips for printing on magnetic tapes. The magnetic tape will be delivered in strips of 1 meter. If you order 3 metres in red, for instance, you'll receive three rolls of 1 metre. The magnetic tapes are available in many different colours. They are anisotropically magnetised, which increases their adhesive force. ... or without writing, just as a colour-coded identification. This magnetic tape is 40 mm wide, so it lends itself to making little signs for the whiteboard. Fancy frame: Magnetic tapes can also add a stylistic note. On the top left the Coloured magnetic tape 20 mm was used, on the right the Coloured magnetic tape 10 mm and below the MT-40.